Guardian PPK2 2 Person Preparedness Package prepares two for survival in the event of a Great Calamity.Deluxe SurvivalWhen fending for your life, do so in the lap of luxury with an eclectic and deluxe collection of tools. Be the envy of those you encounter as you had the forethought to prepare.Two-person CommunityYou may only have one other individual on which you can count. This kit has a shelf-life of 5 years giving you ample opportunity to search for and forge a deep relationship with another human being.Dinner for TwoThis kit contains enough rations to keep two people sustained for a period of time with 24- 4 oz. water pouches and 12- 400 calorie food bars. When water becomes scarce 20 water purification tablets will afford you additional time to forage for anything edible.Jacks of All TradesThese kits are genuine jacks of all trades preparing you for a wide range of encounters. 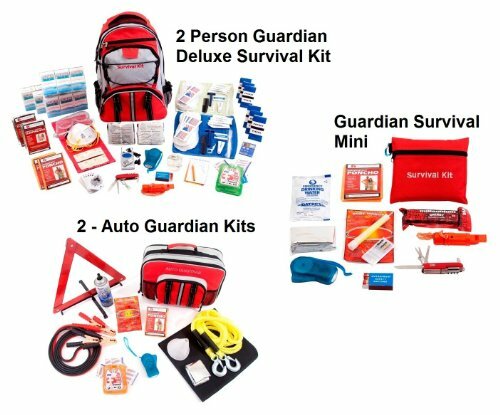 A mini survival kit can be used independent from the kit proper and two auto guardian kits can possibly grant you access to previously disabled automotive transportation.